(R to L) Mr Matsumura, founder of Medical Pine, with Jim Nelson of Enova and two surgeons at the 67th Annual Scientific Meeting of the Japanese Association for Thoracic Surgery. 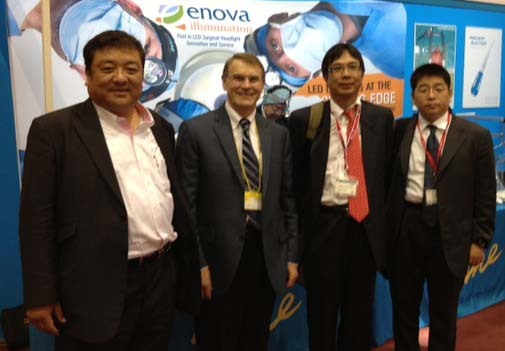 Enova Illumination Director of Sales and Marketing Jim Nelson was recently in Japan to attend the 67th Annual Scientific Meeting of the Japanese Association for Thoracic Surgery. While there he visited with Medical Pine, Enova’s exclusive distributor in Japan, to demonstrate new digital battery packs for Enova’s LED surgical headlights. While all of Enova’s customers will soon benefit from these new battery packs—Enova hopes to have them available by the end of the year–Japanese surgeons were first to request them. Impressed with his visit and Medical Pine, Jim asked Shedding Light to interview Mr. Matsumura, the Owner and President of Medical Pine. Shedding Light: In what medical areas does Medical Pine focus? For what is Medical Pine known? Mr. Matsumura: Medical Pine focuses on heart surgery medical devices. We are known for our instruments for heart surgery for children, including newborn and premature babies. We develop and sell these products. Also we are applying for international patents on some products. Shedding Light: Where is Medical Pine located and how long have you been in business? Mr. Matsumura: Our company is located in downtown Tokyo near the Tokyo Dome Ballpark, which is the home field of the Tokyo Giants, one of our Japanese baseball teams. Medical Pine was founded in 1999. I have been involved in the field of heart surgery products since 1986 and previously worked for a foreign medical equipment manufacturer. Shedding Light: What is Medical Pine’s primary method of marketing to Japanese doctors? Mr. Matsumura: The foundation of our marketing is to maintain a good reputation in the field of heart surgery, which is the most profitable of surgical fields in Japan. Heart surgery, and especially pediatric heart surgery, requires a high level of skill and understanding of changing technology. We also focus our marketing and sales in the area of orthopediac surgery. We often gather doctors together to demonstrate and discuss our new products. As we gain exposure in heart and orthopediac surgery, we expect to expand our business into other fields as well. Shedding Light: How did you arrive at the name ‘Medical Pine’ for your company? What does it mean? Mr. Matsumura: My family name Matsumura means “pine village.” “Matsu” means pine and “mura” means village. So I decided to use “pine” for my company’s name. Shedding Light: How is Japan’s medical landscape changing? Mr. Matsumura: In Japan, the government no longer allocates budgets to hospitals and each hospital has to survive by providing patients with high-quality medical services. That means that Medical Pine needs to provide surgeons with advanced medical devices at low prices. Shedding Light: How did Medical Pine hear about Enova Illumination? What attracted you most to the LED surgical headlights Enova offers? 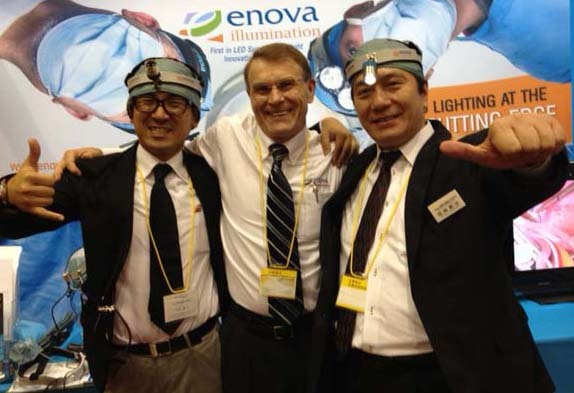 Jim Nelson of Enova with two Medical Pine representatives in Japan. Mr. Matsumura: We first saw Enova’s LED surgical headlights when we attended the American Association for Thoracic Surgery (AATS) in Minneapolis in May 2013 with some heart surgeons. Enova’s headlights offer many advantages, the best of which is the brightness of each headlight. In addition, Enova had a good reputation among the doctors at the conference. I thought the headlights were just what I had been looking for. Shedding Light: What do Japanese surgeons think of Enova’s LED surgical headlights in general? Mr. Matsumura: Japanese surgeons rank Enova’s headlights very highly, especially for their brightness. We promote Enova LED surgical headlights strategically and often compete with other products, especially those imported from Korea. View Enova’s Videos on YouTube!